The story of America is entwined with the myth of the road. 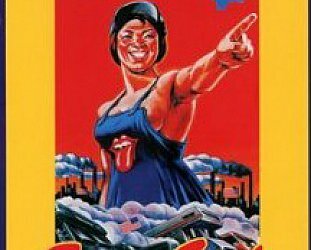 From Daniel Boone and “Go West, Young Man” wagon trains through Jack Kerouac, Easy Rider, Springsteen's lyrics and onto Little Miss Sunshine and Road Trip, the songlines, trails and highways of America have been where people have found redemption and truth. Stories told about the road are of discovery and, just as often, self-discovery. The road takes people through the Great Out-There which is the America between the coasts and only if you have explored that social, cultural and geographical diversity can you truly understand what the “United States” of America means. It means united in difference as much as anything else, and for decades film makers have placed their characters in some part of the Great Out-There which sings of distance, separateness and often isolation, be it geographical or emotional. 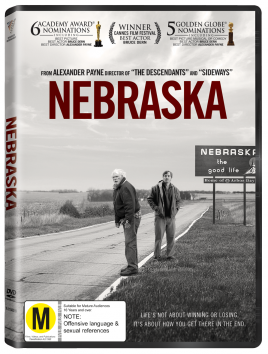 Director Alexander Payne (Sideways, The Descendants) and writer Bob Payne explore many of these ideas in this insightful film named for one of the least populated and flattest states in the country. 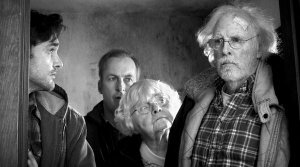 Ironically then, Nebraska is the destination here as the irascible alcoholic old Woody Clark (the magnetic Bruce Dern) and an estranged son David (Will Forte) embark on a trip from Billings in equally empty Montana to collect the $1 million which the old man thinks he has won. This fortune – which everyone but the old fellow knows isn't real – is to be collected from Lincoln, Nebraska and at the start of the narrative we see Woody walking alone down a long road against a huge backdrop of railway lines, factories and a great open sky. Determined to collect his winnings despite his wife and sons' protests, Woody is a single-minded cuss who is emblematic of an older world. And the spare locations of wide roads disappearing to a vanishing point on the distant horizon, flat farmlands, rundown towns and deserted streets – filmed in black'n'white – suggest an almost romantic older America. 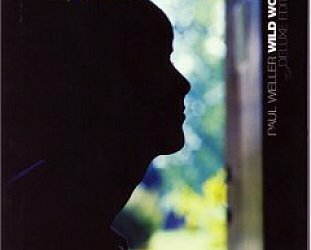 The locations, small towns and wide skies are characters in themselves as Woody and the family which is reluctantly dragged into his dream make their way through the town where they once lived, to the house Woody grew up in and where a brother died (“I was there,” he says flatly when David asks him if he remembers the incident), into old and broken friendships and stories to be relived through understatement. The grumpy Woody has a stillness at his centre – Dern won best actor at last year's Cannes Film Festival for his portrayal – and a blunt way with his few words: “Beer isn't drinking,” he tells the prissy and conservative David; “Just a bunch of rock,” he says dismissing Mt Rushmore. “Doesn't looked finished to me, someone got bored doin' it”. But as their journey continues – interrupted by Woody having an accident, the days spent in his former hometown of Hawthorne where people believe he's now a millionaire – the layers of his life are peeled away. The turns of his life come in single sentences, the full depth of his stillness and taciturn nature revealed in a few phrases from friends, at a cemetery, in a small aside. And there is dark, and sometimes even light, humour here too – encounters with dumb cousins, a theft gone wrong, old friends turning jealous. But at its heart it is a beautifully crafted story about a son finding new respect for a father, a man of his generation parting company with the platitudes of life and relationships, and beautifully observed moments of great tenderness. 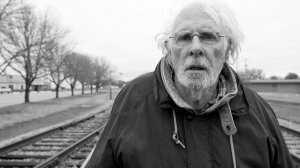 Love comes in many forms here, and Nebraska – a family's life peeled apart like a bitter onion becoming more sweet as the layers fall away – was nominated for six Academy Awards and Five Golden Globes. You can see why in every carefully shot scene, every line of skeletal dialogue and most of all in the silences, space and stillness. As in all road trips, it is never the destination, always the journey.